A new report by a nonpartisan congressional watchdog agency provides a clearer picture of the challenges facing the Secret Service in protecting President Donald Trump at his Mar-a-Lago private club in Florida, where the president freely mingles with high-rolling guests and paying club members across the 20-acre waterfront property. The study from the Government Accountability Office, prompted by a referral from Democrats in February of 2017 after reports Trump discussed national security with Japanese Prime Minister Shinzo Abe in front of club dinner guests after a North Korean missile test, found that the Secret Service provides several layers of security at the club when Trump is in town. "By conducting discussions in this manner, the President enabled private citizens without security clearances to potentially overhear sensitive or classified national security information," Sens. Elizabeth Warren, D-Mass., Sheldon Whitehouse, D-R.I., Tom Udall, D-N.M., and Rep. Elijah Cummings, D-Md., wrote last year. 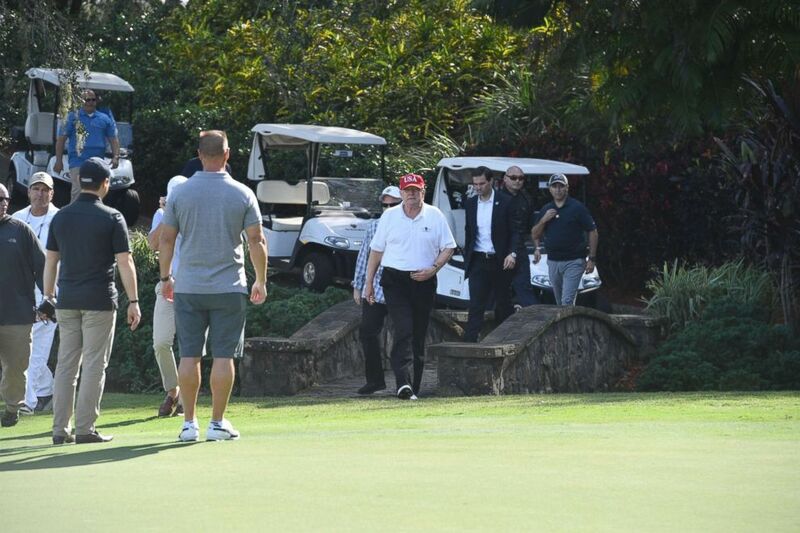 President Donald Trump walks onto the green at the Trump International Golf Course in Mar-a-Lago, Fla., during an invitation for U.S. Coast Guard service members to play golf, Dec. 29, 2017. The report details a multilayered security system around the property when the president is in town, based on a study of Secret Service practices over four visits in February and March of 2017. Around the club grounds, the Secret Service, Coast Guard and local law enforcement patrol the adjacent waterways and entrances to Mar-a-Lago, requiring guests to pass through physical checkpoints depending on the president's location. Inside the compound, the Secret Service sweeps rooms Trump is known to frequent when he stays on the grounds and will secure specific rooms ahead of his planned appearances. The Secret Service also "routinely" conducts background checks of Mar-a-Lago staff, along with other workers and individuals who work in secure areas but might not necessarily interact with Trump. On Tuesday, the GAO released another report conducted at the request of Democrats that found that the government spent nearly $14 million on Trump's four trips to Mar-a-Lago in February and March of 2017, providing the clearest accounting to date of the price tag associated with Trump's travel to his properties. 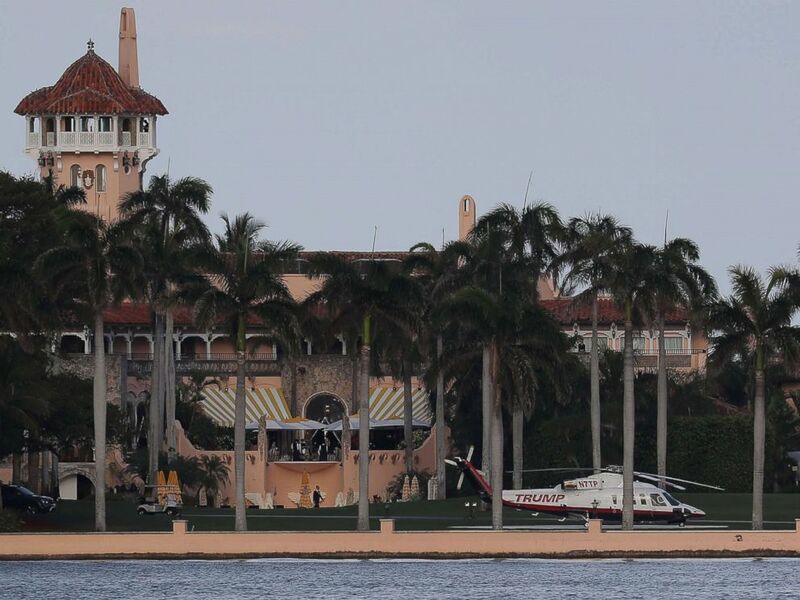 The Trump helicopter is seen at the Mar-a-Lago Resort where President Donald Trump yesterday held meetings with Chinese President Xi Jinping, April 8, 2017, in Palm Beach, Fla. In 2016, the GAO estimated that a four-day trip President Barack Obama took to Chicago and Palm Beach in February 2013 cost about $3.6 million, and that's been used as a baseline to estimate the cost of presidential travel. The GAO's report on Wednesday, which also examined whether the president has donated hotel profits from foreign governments to the United States Treasury, found that the Trump Organization made one lump sum payment of $151,470 to the Treasury on Feb. 22 of 2018. The organization announced that donation in March of 2018. Before his inauguration, when Trump announced he would hand his company over to his two sons, Eric and Don Jr., the president-elect pledged to donate all profits from foreign government patrons at his hotels and other properties. The GAO said the White House counsel's office did not provide any requested information to the agency on security protocol at Mar-a-Lago or payments made to the Treasury by the Trump administration. But the Department of Homeland Security, which oversees the Secret Service, wrote in response that it "is pleased to note GAO's positive recognition of the Secret Service's security measures used to safeguard the President in advance of and during his travel," adding that "the report did not contain any recommendation requiring a response."